Working to get things ready for Thanksgiving, today, I focused on the stuffing. I don’t know about you, but stuffing is integral to my Thanksgiving plate. It’s what catches the gravy. It’s what you snack on, right out of the fridge, while you stare at the contents wondering what to eat next. Stuffing the morning after, fried up a little, with an egg on top? Oh lordy. Right around a year ago, Food52 had a contest for “Your Best Thanksgiving Stuffing.” and I entered my challah stuffing – it’s vegetarian, buttery and herb-filled. While it was selected as a finalist, another meatier stuffing prevailed. Nevertheless, the most exciting part of this whole contest? Definitely when Amanda Hesser and Merrill Stubbs – the founders of Food52 – joined Al Roker on the Today Show and they all made the two finalist stuffing recipes! I was so excited I almost passed out when I heard “Mrs. Wheelbarrow.” But even more wonderful were the comments and reactions I heard in the coming weeks, as friends and strangers alike tried my stuffing recipe. The secret to this stuffing is in the bread. You must use a good challah. I make my own, but you don’t have to. 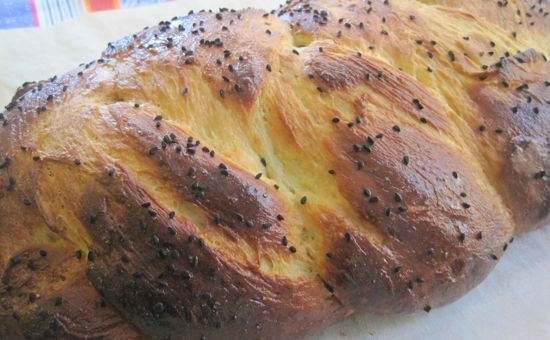 To prepare for Thanksgiving today, locate a source for great challah and order two loaves for your holiday cooking. One loaf will be perfect for your leftover turkey sandwiches. One loaf will be cut into cubes and made into this delicious stuffing. 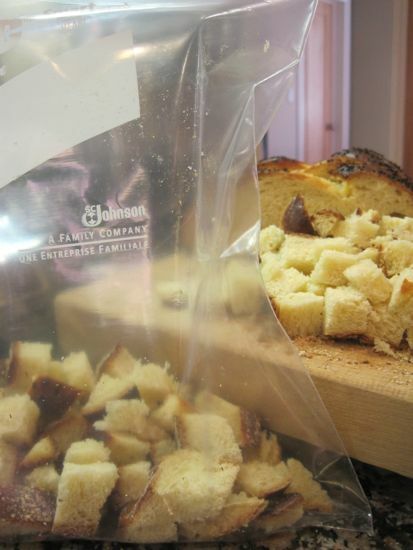 Cut the challah into 1″ cubes. Leave the cubes out on a parchment lined sheet pan, on the counter, to get stale, at least overnight and preferably 3 days. Melt 3 oz of butter ina large heavy sauty pan. Saute the onions until wilted, add the herbs, celery and mushrooms and cook until just slightly cooked thoruhg. Press stuffing into a large buttered baking dish. Cover with buttered parchment and then foil. At this point, the stuffing can be held for several hours, but should be at room temperature before baking. Bake at 350° for 45-55 minutes, the last 10-15 minutes without the foil and parchment, to crisp the surface. And here’s the recipe for my homemade challah. It’s really heavenly. If you are using the stand mixer, get the paddle attachment going at a nice slow pace, and add to the sponge, the eggs and egg yolks, the oil, sugar, salt and honey, and warm water. Scrape the bowl and add about 2.5 c of the flour and mix and scrape the bowl again. Mix for about five minutes at a medium speed. Add four cups of flour. Stir it up with a wooden spoon or a spatula. Don’t worry if it’s all shaggy. Now, walk away from the dough. Take a 10 minute break. Check your email. Make a cup of tea. When you come back, the flour will have absorbed the liquid and it will be much easier to work with. Switch to the dough hook. (Or roll up your sleeves.) Let the hook work on the dough for about 10 minutes. The dough will be nice and elastic, and will have a few little bubbles on the surface. It will be very soft. Flour your counter lightly, turn out the dough and give it a little bit of a knead. Be gentle with it. Push it away, and use the bench scraper to lift and turn. It’s a very delicate dough and the bread will have a better crumb if you use a light touch. Tip the dough into the oiled bowl, cover it with a tea towel and let it rise in a warm place for 2 hours, or until doubled. When it’s all puffy and fabulous, gently deflate the dough (do not punch it down… that’s not nice), and then let it rise again for 45 minutes. Now it’s time to braid your loaves. Tip the dough out of the bowl onto a lightly floured surface and divide into two parts. Then divide each half into three parts. Roll each part into a length about 12″ long. Line the three ropes up side by side. Start in the middle, braid to the end, then braid the other half. (here’s a link to a way-too-long You Tube video showing you how.) Tuck the ends under and pinch them together. There are a number of other braids – a four-rope braid and a six-rope braid. I can just manage the three strand, but that’s just me. Carefully lift the loaf and place it on the sheet pan. Repeat with the second loaf. Brush the loaves with the egg wash, . Sprinkle generously with the seeds. Let the loaves rise, uncovered, for about 30 minutes. Preheat the oven to 375•F/190C. Bake the loaves for 40 minutes, switching their positions halfway through. Check to make sure they’re not browning too quickly, and if they are, tent with foil. When the loaf is finished, a thermometer inserted will measure an internal temp of 190. Pull the loaves out of the oven and cool on a rack. Well, I’m glad you did not pass out 🙂 Your challah looks gorgeous, as does the stuffing. I made a similar stuffing for Robyn Webb this past weekend but with the addition of chestunts and dried cherries. Is it Thanksgiving yet? I am the designated sutffing maker at my brother and sister-in-law’s and this was far and away the best stuffing I’ve ever brought to Thanksgiving dinner. I doubled the recipe and still there was not a speck left. I had happened upon some chanterelles so added those in. This year I will make three batches! 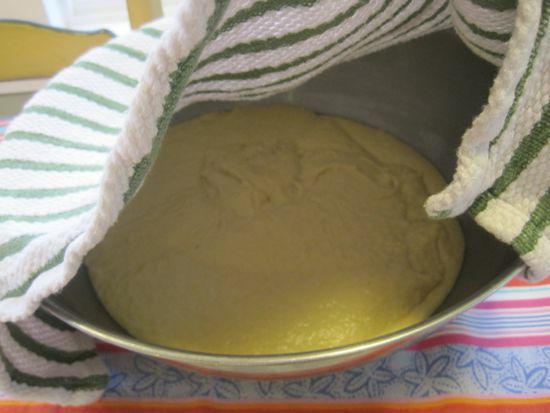 The photo of the dough peeking out from under the kitchen towel is just darling. Okay, now I know the food is wonderful and love the recipe for the challah. Thx a million. Yum! You are a media star!!!! When are you writing that cookbook? I think you have inspired me to make some challah. I made it several years ago, but it splatted a bit. Maybe this time it will be more presentable. Ha! From your keyboard to Harper Collins’ ear… Great to hear from you Sasa. I’ve been watching your posts. You’re doing some seriously lovely cooking! Let’s cook together sometime, hm? Made the stuffing on Saturday night and received rave reviews. I substituted rosemary for thyme since I still had some in the herb garden. I’m making the challah right now! Hope it turns out! I have a question though. The ingredient list says there’s 7-8 cups of flour, and the instructions only have 6 1/2 cups. Is the rest of the flour added during the 10 minutes of kneading, or when you take it out and knead it by hand? I did the latter because it was SO soft and gooey instead of dough-like. It’s a very soft dough. The dough will take more flour, but if you can use less, it will be lighter. Either way, it’s going to taste great! So glad you made it. It’s that time of year again! Came across your recipe and was wondering – can you make it ahead of time and refrigerate it until you’re ready to bake it? Say, overnight? Hi Annie and happy Thanksgiving. Yes, you can make the stuffing ahead of time. I usually sauté the vegetables and hold those in one bowl, then mix with the bread and butter before baking. However, there’s no reason you can’t prep the entire baking dish the night before, if that’s easier. I often am fighting for space in the fridge that night before, so a zip bag of cooked veggies is easier to store!! I made this for Thanksgiving yesterday and my boyfriend said it’s the best stuffing he’s ever had. I think so too! It came out a little watery though. 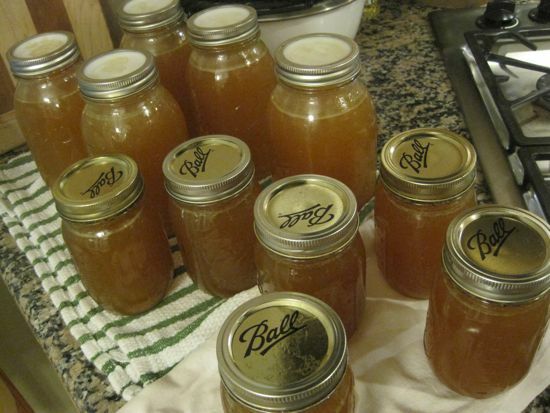 I think next time I’ll use less vegetable broth, unless you have a different suggestion. Somewhere between 12 and 16 cups! This recipe is seems awesome, about how many servings does this make? I’ve been cooking long enough to know what I like. 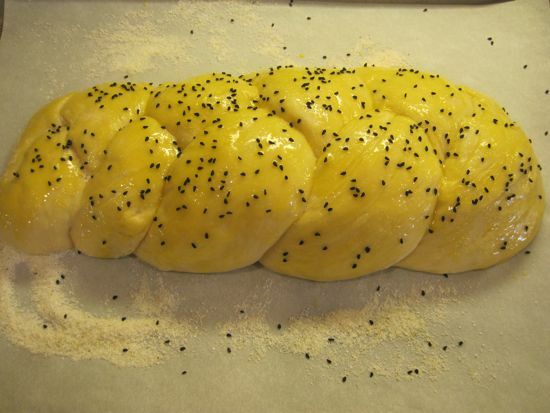 I know how I like stuffing….no carrots, no sage, no water chestnuts, no weird stuff, no preservatives, no chemically laden canned soups or herb mixes… I found this recipe and was intrigued….CHALLAH as the base??!? But I decided to give it a go because all the ingredients sounded yummy. First I made your challah recipe. I’ve been making challah for years now. I found the recipe well written and easy. The resulting challot were gorgeous. But they were very bland for my personal tastes. 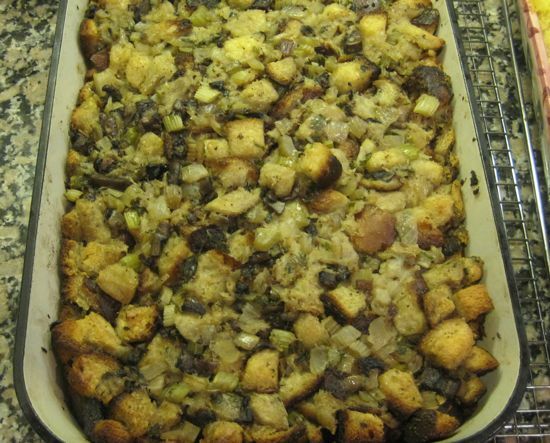 OK…so we ate one loaf on a Friday and then I made one pan of stuffing with the other and…. …OMG that stuffing was AMAZING!! Exactly what stuffing should be for me! What I felt was the blandness of the challah on its own, allowed the other stuffing ingredients to really shine against the backdrop of the rich challah. SOOOO GOOD! Thanks for sharing. This will definitely be my to-go stuffing recipe from now on! I’m in the rising stage of this recipe and wondering what happened. I weighed out the flour and had to add four cups more because it looked like pancake batter. Hope this works. Let you know what happens. How did it turn out? How much flour did you add? I had to reread the recipe a few times as it has you add 2.5 cups at one point, and then later on has you adding an additional 4 cups. I still end up adding another cup or two to hit the right texture. Janice, it came out good. I really had to add another cup of flour to it when I was shaping it but it’s very good. I know all my measurements were right so I’m not sure what happened but all’s well.